You all have heard of the Time/Money/Elbow Grease triangle for accomplishing goals? Well sometimes, elbow grease can be exchanged for ingenuity. That's what we think and we think that gamification can be like dynamite, leveraging attention and focus when used properly. Think of it as a multiplier against one of the three points of that triangle. Gamification is not new. Most businesses practice it in one form or another, whether they run a photo contest or have a rewards program. 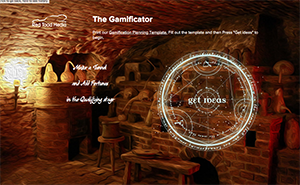 Gamification is the art of transforming a normal process into something special and engaging. Sometimes this is a high tech thing that you do, with a complicated system. Sometimes this is a simple thing, with a graphic or even just with words. Whether complicated or simple, this practice can give your internet marketing sales funnels a shot in the arm. We built the Gamificator to help people brainstorm ideas that they can apply to their online sales and marketing funnels. It is just an idea generator but when used with our Planning Template, it can be a powerful tool. The reason that Gamification works is that you engage your user on a higher level. If you'd like to know more, you can follow a presentation on the subject either in the video or in a slideshow. If you're interested in implementing a campaign, contact us. We are working on some turnkey programs, but we really enjoy generating ideas to solve problems. To learn how to use the Gamificator, click here.